The procession that crosses Chaucer's pages is as full of life and as richly textured as a medieval tapestry. The Knight, the Miller, the Friar, the Squire, the Prioress, the Wife of Bath, and others who make up the cast of characters -- including Chaucer himself -- are real people, with human emotions and weaknesses. When it is remembered that Chaucer wrote in English at a time when Latin was the standard literary language across western Europe, the magnitude of his achievement is even more remarkable. 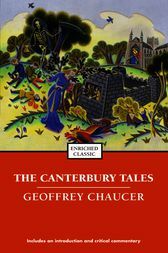 But Chaucer's genius needs no historical introduction; it bursts forth from every page of The Canterbury Tales. Geoffrey Chaucer, considered by many to be both the father of modern English poetry and the father of the modern English novel (for Troilus and Criseyde), also distinguished himself in his lifetime as a civil servant and diplomat under three kings of England. When he was taken prisoner by the French, the King himself contributed to his ransom. When, in later years, the King wished to reward Chaucer for his services to the crown, he was granted -- among other favors -- the right to demand a daily jug of wine from the pantry of the royal butler. Toward the end of his career, he became a knight of the shire for Kent. But it is for The Canterbury Tales that he is best remembered. This masterpiece of English literature moved Aldous Huxley to say, "If I dared to wish for genius, I would ask for the grace to write The Canterbury Tales."